LANDSCAPES There are	91 products. A decoration with country landscapes. 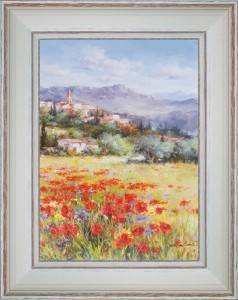 Our collection of paintings of landscapes will illuminate your decoration with the lively and warm colors of the Provençal country atmosphere. 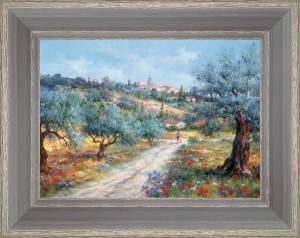 These typical places of the Mediterranean region which invade our thoughts, hung up on your walls: seaside, fields of lavenders or sunflowers, poppies which are next to olive trees, and also snowy mountains. 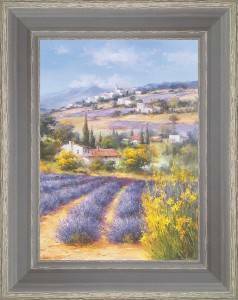 To decorate walls with the cheerfulness and the sun, cheer up the house with landscapes full of souvenirs, choose paintings of decoration which smell well Provence. On the shaded terrace lined with flowers, the soft noise of the Provençal fountain rocks the summer everyday life.
" In these magic places the time scrolls differently, the smells of Provence invade the atmosphere." 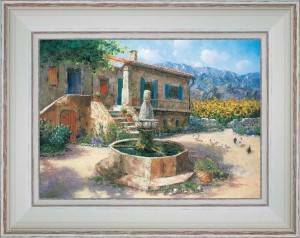 The water of the fountain pours at the rate of the seasons and gathers for diverse reasons the occupants of the Provençal farm. Reduced to a net the summer it is the vital element of our Southern regions. "Well before "Manon des Sources", our ancestors always looked for the water source before implanting their activity and building the ancient country-house." 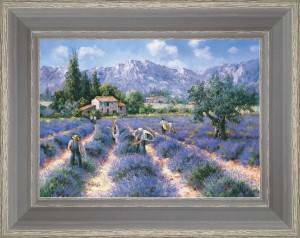 In summer the collectors of lavender work very early in the morning, up to the lunchtime who wait for them in the small house. 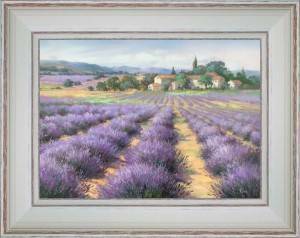 "Nowadays in Provence the machine in replaced the man in the fields of lavender. Nobody regrets this work exhausting under the heat wave. " 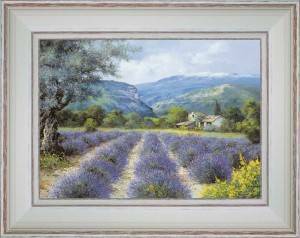 The mount Ventoux in the background, fields of lavender sinks into the hilly relief of Provence. 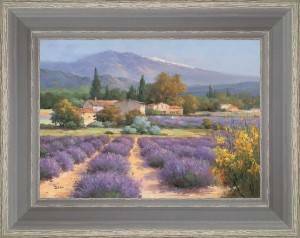 "Under the Mount Ventoux push the real fine lavender the blue of which remains always intense." 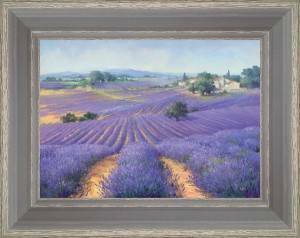 The lines of lavenders invade countryside as a wave which rushes into reliefs and marries all forms of the ground. "Positioned at the beginning of fields the length and the linearity of these long blue lines give the dizziness. " At the end of the spring fields of lavender adorns itself with its bluish color which contrasts with yellow deep of brooms still in flowers. The colors of Provence in the wild state. 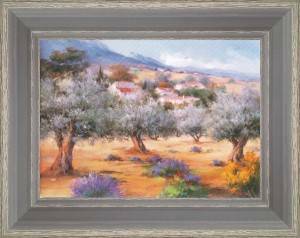 "On the background of blue sky, evergreen leaves of the olive tree come stacked the green and the silver in this explosion of colors." The grape harvest approaches for this vineyard in the long green rows stained with nuggets in cluster. At the bottom, the ancient country-house and the wine cellar. "At this summer end, in the freshness of places everybody bustles with the aim of the harvest which to approach, to welcome the grape then transform it." 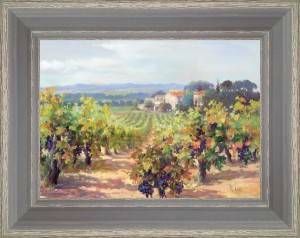 In the breath of the mistral, the cart is ready, the picking of olives can begin. 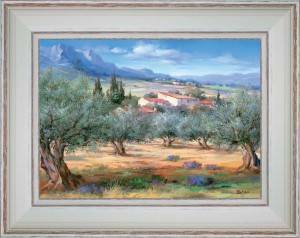 "Under the influence of the wind so changeable, the reflections of the olive trees's leaves give life in Provence." On the wooden scales the hand of the collector of olive bustles ceaselessly.
" 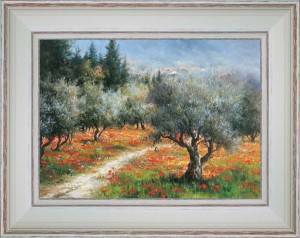 From the beginning to the end of the winter the fields of olive trees know a big activity. " 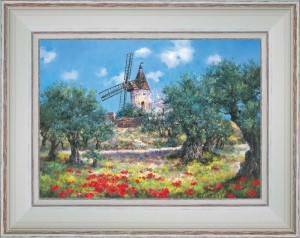 In spring the poppy is friendly next to the hundred-years-old olive trees, the marriage is of the most beautiful effect.
" If the farmer maintenance too closely these olive trees you will never attend this magnificent show. " 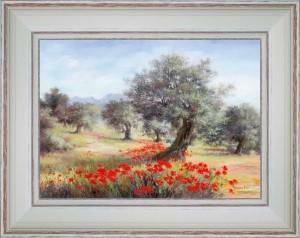 In a heat haze poppies drill the ground to come to contrast with the green and the silver of the leaves of olive trees. "At the foot of these hundred-year-old trees the Mediterranean vegetation takes advantage of the quite particular attention carried in olive trees." 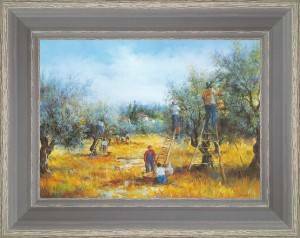 The olive grove is one fields of plantation of olive trees intended for the culture of the olive, or olive growing, which lines the little ways of Provence and is next to houses. "The olive groves of the Leases of Provence, famous for these olives broken, are among the most known and the most appreciated." 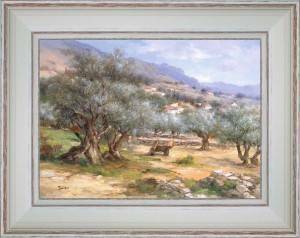 Hundred-year-old olive trees spread in small valley with fields of lavenders in bottom, bounded by youngs cypress. 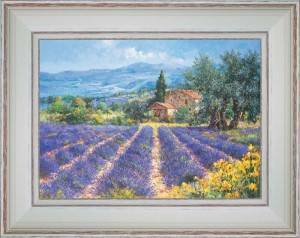 "All the botany so varied by Provence in colors pastels carefully chosen. Some more steady but constantly harmonious touches." The mauve trainées of the lavender crosses the Provençal countryside at this summer beginning.
" In July begin the first cuttings of lavender, it can last until in the middle of August. " 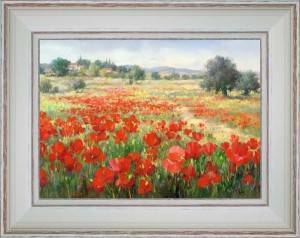 The red reflections of poppies invades the landscapes of Provence in these radiant springs. "In lands not cultivated intensely poppies try new appearances." 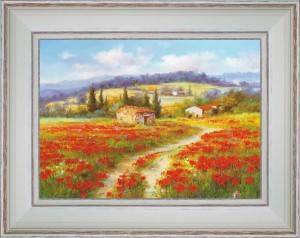 Over time poppies spread out in the Provençal country. They get involved without concession in all the surrounding essences. "Bursting red points which dance or wave according to the wind and lie down in front of mistral. " Poppies invade the nature. In fields, around small houses, on cart tracks the red dominates. A magic country atmosphere. "Privileged subject of the painters of flowers, the poppy blooms in spring and gives to the country a finally found gaiety." 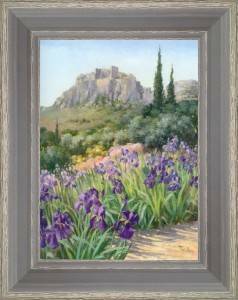 In spring in rocky ways in the middle of olive trees, the nature adorns itself with a multitude of flowers which decorate subtly fields. "It is more that a walk, it is the discovery in the rich and varied flora which abounds and perfumes." Often perched on a headland, the ancient country-house dominates the lands of the domain. As far as the eye can see, under surveillance, fields of wheat and lavenders. "Not far from the building the threshing floor of the wheat which was dried then stored and preserved in the attic." Provençal houses in the middle of the fields of lavenders. Cypress hedges between fields and attractive stony wall with the broom. "Swept by the wind in winter, these big lands of Noon is illuminated with one thousand colors in the spring while waiting for the arrival of the heat wave." 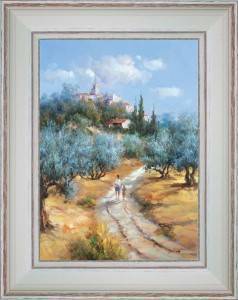 In summer, in the cool of the evening, a walk on the dirt tracks which separate the fields of olive tree which spread out below the village. "The smells of Provence type you in the nose and the song of cicadas bewitches you for ever." 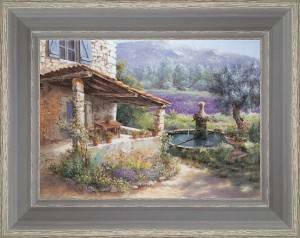 A Provençal country house hidden in olive trees strewed with bundles of lavenders in front of a calcareous mountain which cuts on the blue sky. "In summer the cicada song will stop only in the night. It rocks a scorching atmosphere convenient to the nap." 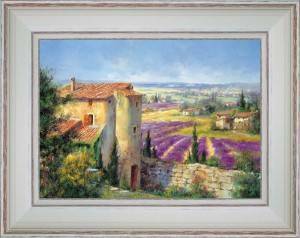 A small hamlet full of charm in the Provençal Drôme and always of areas of lavenders to color the painting. "The majesty of the Mount Ventoux to the four winds the benevolence of which dominates the landscape." 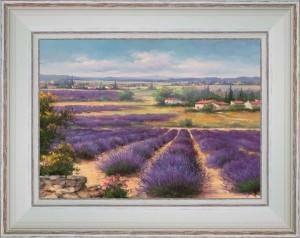 The Haute-Provence possesses a poor and calcareous ground adapted well to this need to suffer that wait for the lavender. Hives and bees accompany the decoration. An attractive village at the end of the regular lines. 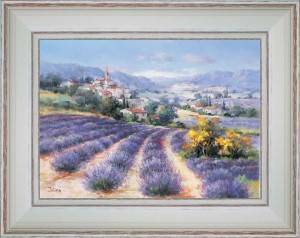 "A dry landscape where the ground is white, cheered up by the brightness of the lavender and the brooms. Rigorous clear sky." 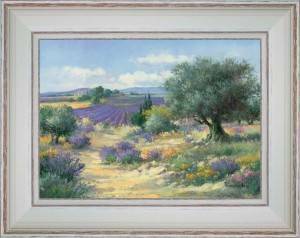 In the plain, in border of fields of lavenders a row of olive trees aligned north side and cleanly maintained. "Both cultures does not annoy. On the contrary she asks for attention and for maintenance in different periods." 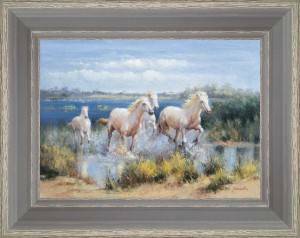 Horses of the Camargue at a gallop in this wonderful area where it live free when it are not used for the work. "The Camargue is the exact name of the race of these small horses which we find around all the herds of bulls." 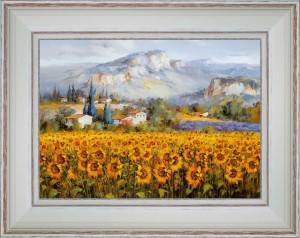 All the heads yellow turned to the sun, our sunflowers of Provence illuminate fields during the summer. 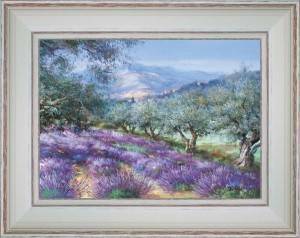 "A fabulous contrast of colors when they adjoin one fields of lavender, the yellow challenges then the mauve." Often the iris surligne the typically Provençal path of cypress of our wild gardens. "The cypress from his part protects the iris of the mistral, but also all the plantations situated between these hedges." The windmill implanted on the heights of the relief takes advantage of an often present wind and dominates majestically the decoration of crib of the Provençal villages. Monique &...: "TOUTES NOS FELICITATIONS POUR VOTRE EXCELLENT TRAVAIL. La Poste nous a livré le tableau, ce matin, sous un..."